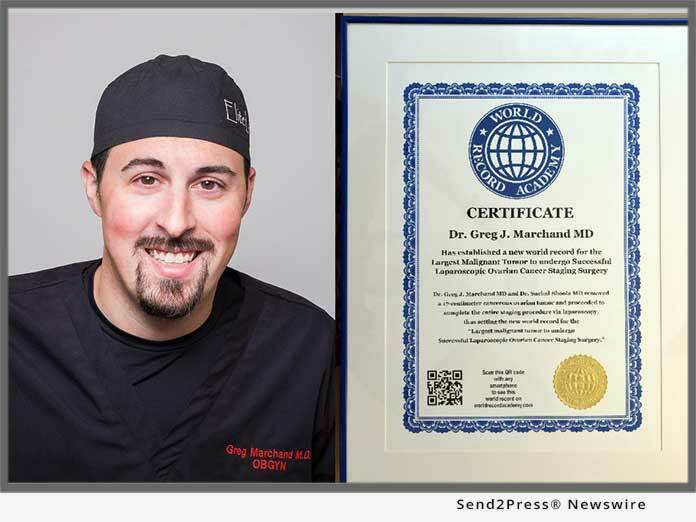 MESA, Ariz., Oct 12, 2017 (SEND2PRESS NEWSWIRE) — The World Record Academy recently awarded Dr. Greg J. Marchand and his surgical team a world record for removing a 17-centimeter cancerous ovarian tumor using only small incisions in the abdomen, a technique called a laparoscopy. While removing cysts and tumors using laparoscopic surgery is a standard practice, Dr. Marchand said it is rare to use the technique in conjunction with an ovarian cancer staging procedure. Marchand said the most difficult part of the surgery was removing the cancerous mass without spilling any cancer cells into the abdomen. If cancerous material spilled back into the abdomen the cancer could have spread and worsened the patient’s prognosis. The World Record Academy helped verify that this type technique had never been accomplished previously on any malignant tumor this large. Dr. Marchand was diagnosed in 2010 with mixed-cell carcinoma, (an aggressive cancer of the testes,) said it is particularly gratifying that his technique can help cancer patients. He received surgery and treatments in 2010, and has been in remission since. In addition to the two world records, Dr. Marchand is extensively published in laparoscopic surgery and was recently the first U.S. surgeon to receive the “Master Surgeon” recognition from The American Association of Gynecologic Laparoscopist’s (AAGL.org) and the Surgical Review Corporation (surgicalreview.org). Dr. Marchand is internationally regarded as an expert in developing and performing advanced surgical techniques, particularly in minimally invasive surgery. Dr. Marchand is currently the only “Master Surgeon” in the state of Arizona. For further information regarding Dr. Marchand and his publications and research please visit http://gregmarchandmd.com/. “I underwent surgery and treatments after I was diagnosed with Mixed Cell Testicular Cancer in 2010. I am very lucky that the surgery for my stage of Testicular cancer was a very minimally invasive procedure, and that I had a good surgeon. I remember the horrible fear of ‘just not knowing what was going to happen,’ and I think that fear is really worse than any of the pain of the cancer or the treatments. When I woke up from the surgery, I really felt great, and over the next few days I had a very quick recovery. “I was able to get back into my life quickly, and although I was still afraid of what was to come, I felt like I had the strength to fight. When I think about my patients with Ovarian cancer, I would like them to be able to come out of surgery feeling like they have the strength to fight, to take on the cancer. I can imagine that when you are recovering from a one of these big, open traditional staging procedures, you’re in excruciating pain, you really can’t move, and you like you’ve just been hit by a bus. I’m sure you don’t feel strong and ready to fight the cancer at that point. You might just feel like giving up. If my technique can help even a few patients avoid that feeling, then thats the most valuable thing in the world to me. Please contact the Marchand OBGYN PR department at the below address. ABC News: Dr. Greg J. Marchand MD Invents and performs record setting cancer surgery!